Calgary Data Center offering Colocation for all Canadian Business. Built in 1999, the Calgary data centre provides a secure, climate-controlled environment with access to high bandwidth Internet for hosting the mission-critical network equipment and web servers. Increasingly, businesses are recognizing the benefits that come with colocation of services and mission-critical servers within a data centre. Colocation is proving popular for the time and cost savings a company can realize as result of using someone else’s facilities. With IT and communications facilities in safe, secure hands, telecommunications, Internet, ASP and content providers, as well as enterprises, enjoy faster access to market and the freedom to focus on their core business. 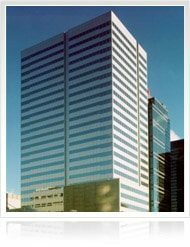 HostedinCanada.com Networks Data Centers’s data centre is conveniently located in the Watermark Tower at 530-8th Avenue SW. Watermark Tower is a 27-story, class “A” office building located in the heart of Calgary’s downtown and retail district.